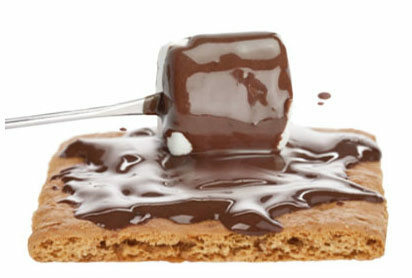 In case you didn’t know, August 10 is National S’mores Day – a day to celebrate that melty treat of roasted marshmallows, chocolate and graham crackers. Just thinking about it conjures up images of campfires… Campfires are romantic, but most of us don’t make them all that often – certainly not in equal proportion to our desire to down this gooey snack. That’s where Emmi Swiss is stepping in to step up the s’mores game. This premium dairy brand is making summer even sweeter by showing how we can make s’mores sans campfire, with the help of their chocolate fondue. It makes sense: dipping a marshmallow in hot fondue creates the melt without the outdoor mess. To help spread the word, the brand has created the Swiss S’mores Sweepstakes: a social media promotion that is rewarding winners weekly with their own Swiss S’mores kit, culminating on National S’mores Day. Why does this promo work? It’s an easy-to-understand and easy-to-enter sweepstakes that builds awareness of the Emmi Swiss brand, their Swiss Chocolate Fondue product and the fun experience that both s’mores and fondue share. The prize supports their brand: gourmet Swiss dairy. The appeal is almost universal. So much for Swiss neutrality…when it comes to tasteful promotions, Emmi Swiss is making a very definite taste statement.